Just as our evolution to the knowledge economy is providing opportunities to recycle suburbia, as Time Magazine puts it, a less intimidating precedent would be how we’ve recycled manufacturing industrial districts to suit contemporary needs. 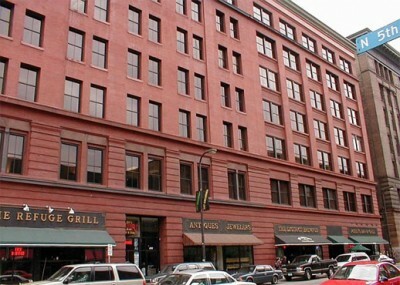 The Minneapolis Warehouse District is one of the best examples of recycling warehouses into an entire 50-block retail and entertainment neighborhood, with a core of about 60 historic warehouses (pictured) in a seven-block area. Known as the SoHo of the Midwest for dubious reasons, the creative renaissance already occurred 30 years ago and has already gentrified, but at least has retained dozens upon dozens of local, independent coffeehouses, restaurants, cafes, shops, galleries and theaters as well as hundreds of new downtown housing, albeit not necessarily attainably-priced. The point is, Minneapolis has long provided a national model for retaining a significant downtown population, and its best days are yet to come. The 508-member Minneapolis Warehouse Entertainment District even has a nascent Facebook Fan Page. Its finding its new face….there is a new ballpark going up and the condo boom of recent years has begun to settle. The days when artist space and cheap start-up office digs are mostly gone but the most of the buildings remain and are finding new uses. Service retail is thriving more now than it has in the past due to the new residents. Creatives are and have always been coming to the area…its just a bit more expensive now. The hard lesson is that many of the buildings of the old warehouse district were razed in the mid-20th century in the name of modernization. Many had to go but a lot of recycle opportunities were missed. Still, there seems to be a good handle now on reuse and preservation vs. highest and best use. Some would say the best days of the MPLS WHD has already come and gone but I’d suggest that the new day is an exciting one so long as we keep evolving while respecting the structures that were built to last generations. Personally, I’ve been in the working in area my entire adult life and the examples I see out my window(good and bad) are reasons I am in commercial real estate. Thanks for taking notice of our neighborhood. Another key ingredient of the Warehouse District’s (or North Loop which is the “proper” neighborhood name) success is its office component. The area is home to dozens of creative firms–advertising, marketing, architecture, design–they all cluster here. The area was once described as a Mini Madison Avenue b/c ad firms were relocating here for the energy and the benefits of clustering. I can see the change/vibe happening – The anticipation of the new Twins stadium will be huge I believe as we come out of the recession next year – I think Block E has been failure and hopefully the city can make that right……ESPN ZONE???!!! That would be NICE! !